some goodies. now to save for some rods and a tensioner setup. I don't doubt he could one-off one considering they're all built from scratch. Also, do you think this kludge setup would be better all around than the good old 90+? some guys, possibly on savarturbo, measured the WOT exhaust temp on a long runner turbo manifold, almost exactly what you have... it was a measurable temperature difference from the manifold to the collector at the turbo, but not much. not much at all. i don't want to quote the temperature without remembering for sure what it was, but it was a couple degrees Celsius. i can say the temp on mine, measuring just @ idle, both ends of the turbo 'adapter'... where it meets the factory exhaust manifold, and where it meets the turbo... measured with an accurate IR thermometer (so just surface temp of the adapter)... it was a whopping 8 degree difference. at idle. if the surface temperature is that close, i'm guessing exhaust gasses that are actually moving and have little time to cool against the walls of the adapter, are barely changing at all. 'specially when taking into account the pre-turbo back pressure helping keep things all hot. 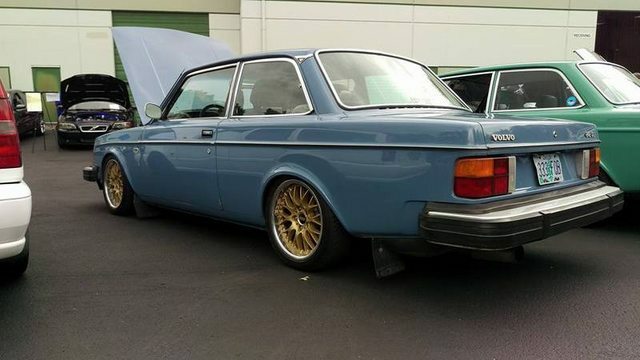 -'72 volvo 142e b20, holset, ms, etc. LOL. I was waiting to read something like this. I've been wanting to do an up-pipe from the stock N/A manifold for some time now. I think it will work out awesome. The only concern I saw when I was thinking about doing it is the 3 bolt flange that always leaks at the outlet of the N/A manifold. I'm pumped to see the outcome. sam used a flange off an NA car, and it warped up pretty bad and was too thin to really reliably seal up, so he bolted it up and welded it to the manifold. I had a 1/2 inch SS flange made, and welded everything together with it all bolted up, it doesn't appear to have warped hardly any if at all. works well on his 8v with the same turbo, so I'm thinking it'll be a ridiculous stump pullin' sominabitch with a 16v head. not shooting for a lot of hp. I imagine it will make good power numbers too. Are you keeping it internally gated? Kenny, I done got **** that **** out of your thread. only got the one cause it's a major pita to flag a page and a half. We can have this discussion (again) in performance if people want to have it, but it's not up for debate on this project or in this thread. removed 25 more, per the big man. we can talk theoretical and ideal all you want... just not in this thread. Sorry if i missed it but what will you be using for fuel/spark management? Really excited to hear about the results. Will this get strapped down? yeah it'll hit the dyno. I'll try and dyno it as it sits now, shuffle the stuff in, toss a basic LH tune on it, see how that works out, but it's going to get MS'd. got the box from FCP, giggidy. replaced the tailgate struts. no more headache, yay. just need to dig up some small things like rods and i'm set. Say wha? I think Kenny has used MS a couple of times. I have thought about AEM as well. I do want to play with the new MS stuff though, more than I want to play with an AEM. who knows. I have some MS stuff, and I have the LH ****, so that's where I'll start. well, sam is running the aem right?